Researchers from the Salk Institute used the latest DNA sequencing technologies to study exactly what happens at a molecular level when new genes are inserted into plants. Scientists usually rely on Agrobacterium tumefaciens when they want to put a new gene into a plant. Decades ago, scientists discovered that when the bacteria infected a tree, it transferred some of its DNA to the tree's genome. Since then, researchers have co-opted this transfer ability of Agrobacterium for their own purposes, using its transfer-DNA (T-DNA) to move a desired gene into a plant. Recently, DNA sequencing technologies started to hint that when the Agrobacterium T-DNA is used to insert new genes into a plant, it may cause additional changes to the structural and chemical properties of the native DNA. Since the T-DNA approach can lead to an integration of many copies of a desired gene into a plant, it can be difficult to study the final result with standard DNA sequencing. Joseph Ecker, a professor in Salk's Plant Molecular and Cellular Biology Laboratory and head of the Genomic Analysis Laboratory and his colleagues turned to a new combination of approaches. These include optical mapping and nanopore sequencing. 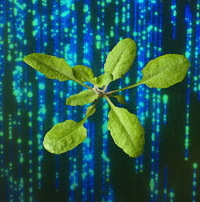 They applied the technologies to four randomly selected T-DNA lines of Arabidopsis thaliana, a commonly used model plant in biology. Optical mapping revealed that the plants had between one and seven distinct insertions or rearrangements in their genomes. Nanopore sequencing and reconstruction of the genomes of two lines confirmed the insertions to single-letter resolution. Gene insertions themselves showed a variety of patterns, with the inserted DNA fragment sometimes scrambled, inverted or even silenced. For more details, read the article in Salk News.